Essential grammar reference and practice for anyone using English in a business context. 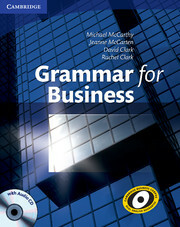 Grammar for Business is a must-have for intermediate business students and anyone using English in the workplace. It provides clear explanations and authentic practice of the most essential language used in business English. Designed to help you improve your communication skills in real business situations, it includes a unique focus on spoken as well as written grammar, and practical tips on areas such as organising presentations, negotiating and giving your opinion. Ideal for classroom use and self study. Based on a corpus of real written and spoken business English to ensure you learn language as it's really used. Includes a special focus on speaking strategies to help you get your point across more effectively in business. Clearly explains differences between formal and informal language and British and American English. 'Make it personal' sections encourage you to apply what you have learnt to your own personal experience. Audio CD provides extra speaking and listening practice.